Andrea Pirlo calls it "the most dangerous spot in the whole of Turin... especially at half-time". A little corner of the Juventus dressing room, next to goalkeeper Gianluigi Buffon, but immediately in front of the door. The same door through which coach Antonio Conte bursts during the interval of each game, invariably spraying indiscriminate anger across the room. "Even when we're winning, Conte comes in and hurls against the wall (and thus my little corner) anything he can lay his hands on... almost always full bottles of water. Fizzy water. Very fizzy water," explains Pirlo in his new autobiography, I Think, Therefore I Play. "If I could go back in time, I'd change only one thing: I wouldn't pick the spot next to Buffon in our dressing room." Such burning rage would undermine some managers, their sound and fury soon fading to a tiresome soundtrack, yet it has underpinned Juve's third consecutive title under Conte's stewardship. A title confirmed when nearest rivals Roma suffered a shock 4-1 defeat at Catania. That the second of those crowns was earned despite the combustible coach being absent from the dressing room for the first four months of the campaign, as he served a suspension for his involvement in the 'Calcioscommesse' match-fixing affair, only serves to gild the achievement. Pirlo says when Conte speaks "his words assault you", adding: "They crash through the doors of your mind, often quite violently, and settle deep within you." Yet despite his Scudetto successes, the 44-year-old's voice carries little resonance outside Italy, and his name little lustre. Why? Perhaps the wider perception of Serie A is part of it - the notion Italy's top division carries a stale smell of faded grandeur - or perhaps Conte's hitherto unimpressive resume has left an unappealing aroma. A mainstay of the belligerent Juventus side that rampaged through Europe during the mid-90s, the combative midfielder won five league titles and the 1996 Champions League, as well as earning 20 caps for Italy. Yet that success did not transfer to management immediately. Stints with Arezzo, Bari and Siena were underwhelming - albeit he led the latter two to promotion - and were interrupted by a calamitous few months with Serie A side Atalanta, Conte's departure coming after police were required to intervene in an altercation between him and a group of the club's supporters. It was a bold move, then, by Juventus to appoint him as coach in May 2011, just a couple of days before Pirlo, one of the grandees of AC Milan, was lured to Turin on a free transfer. Pirlo is a man of astonishing accomplishments, an outlandishly gifted playmaker who was man of the match in Italy's World Cup final triumph of 2006, has won five Serie A titles and lifted the Champions League twice. Here is a man who embodies everything that is beautiful about Italian football - and he was soon in love with Conte's vision and demands of the Old Lady. "I was expecting him to be good, but not this good. One little speech, a few simple words, was all it took for him to win me over. Me and the whole of Juventus." Pirlo had considered Conte to be tough, committed and charismatic but was taken aback by his technical and tactical awareness. His eyes widened, too, when he first experienced one of the coach's favoured drills: having his side enact full-scale practice matches without opponents and commanding them to repeat the same moves over and over until the players are begging to stop. "He's not a guru, nor is he a magician, for all he's been known to pull some crazy speeches out of the hat," Pirlo adds. "You either do what he says or you don't play. But he's plainly allergic to error - perhaps to horror as well - and I for one pray every day that a cure is never found. "We won the Scudetto at the first time of asking and the success was all his, a triumph of bloody-mindedness that went beyond everyone's expectations. "It really couldn't have gone any other way, given the example we had in front of us every day. Conte was like a man possessed, the very essence of Juventus burned deep into his soul. 'You all need the same anger as me. Full stop.'" Pirlo invokes an old Italian phrase that translates as "he'd a devil for hair" to describe the coach and, certainly, Conte cuts a curious character. Lampooned in Italy for having had a transplant to address his baldness - "if the hair was fake then the devil was 100% real," adds Pirlo, archly - he is also taunted for having christened his daughter Vittoria, the Italian for victory. Yet they pale in comparison to the stain of the Calcioscommesse affair. Despite his protestations of innocence, Conte was banned from football for 10 months for failing to report alleged match-fixing while coach of Siena and, while his sanction was later reduced to four months, he was still unable to lead Juve on match days for the first half of his second season in charge. "It drove him absolutely crazy that he couldn't pop his head into the dressing room, but let's just say he ended up there a few times by mistake," Pirlo writes. "His absence was obvious at half-time, but Conte supplied the ideas and words, and his assistants put their faces to them. "I never once saw him cry or get upset and he was good at keeping us separate from his problems and making out that nothing had changed. "Only once, just before the bomb went off, did he ask the leaders for help. He said to us: 'When I'm not there, you be the ones who keep the rest of the boys on their toes. Don't let everything we've built go to hell in a handcart.'" Even in his most fraught moments, Conte's pursuit of perfectionism persisted. It is what has shaped him as a manager, and will continue to do so, either in Turin or perhaps elsewhere one day, should he finally earn the praise outside Italy that his work merits. If that day comes, the most dangerous spot in the whole of Turin will become a haven once again. But, despite his protestations, Pirlo will consider that a real shame. What next for Conte after Juve triumph? 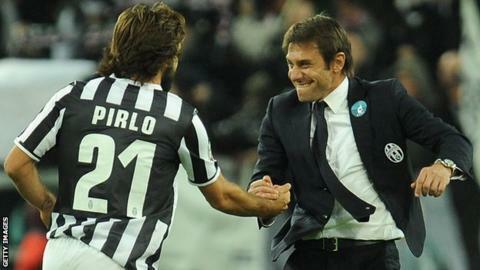 Read more on What next for Juventus coach Antonio Conte after title triumph?